Learn how to (freaking finally!) become confident and consistent creating content for your biz! You have a content strategy, now what? 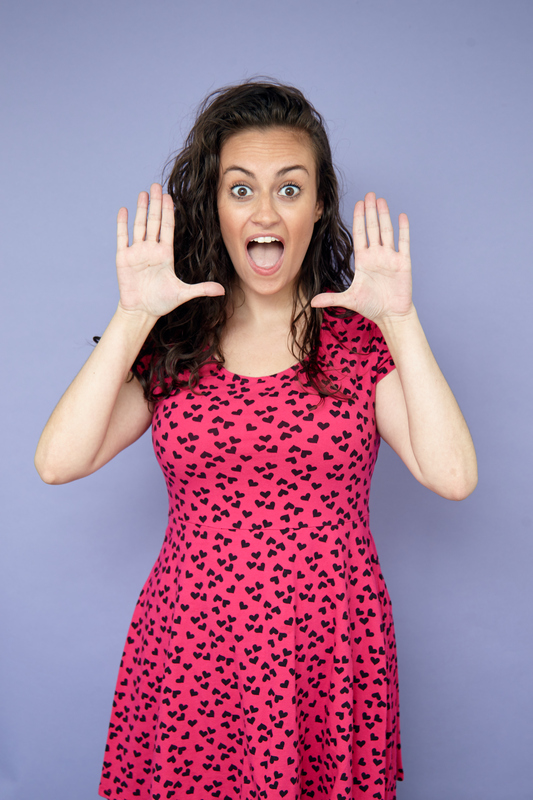 You’ve heard ALL about content marketing and are sooo jazzed about it. You’ve bingewatched the webinars more than you’ve bingewatched Parks and Rec. You’ve mapped out your personas to the teeniest detail. And you have all these ideas that you know are going to be crazy helpful for your ideal customer. YASSSS, you're gonna become a content rockstar! You even created a Trello board for your editorial calendar. A FREAKING TRELLO BOARD. That’s how you know you're serious. So you’ve got your content strategy, your fancy calendar, and all these great ideas...you should be good to go, right? Lololol nopeeee. Nope. Nope. NOPE. There’s still one thing you don’t have: actual, real live content. Stuff that you can post on your blog and email to your list to make people find you, fall in love with you, and throw money at your face. I’m talking words on the page. And that part - the actual writing and creating - is so overwhelming it makes you wanna slam your laptop shut, reach for the nearest family-sized bag of Lays chips, and escape into Great British Bake-Off instead of doing your job and growing your business. You see advice like “just create high quality content,” but what even IS that?! And how do you sound “high quality” while still sounding like yourself? How do you balance sounding like yourself with SEO and optimization and all that stuff that seems even more boring than it does complicated? Ah wait, one more question...How long should all this be and how often should you do it? You end up just giving up. The blog post is deleted, your newsletter is cancelled, daily social media posts are in the trash. It’s time to put down your editorial calendar, stop tweaking your content strategy, and start creating. You have the ideas, you know your customers...you just need to figure out how to get the ideas out of your head and onto your website, so future subscribers and leads can see it. Become confident enough in your writing that you actually LIKE putting your ideas out into the world, and can’t wait to see what your customers think about it! So let’s make like 90’s Nickelodeon and figure it out! The Confident Content Creation Workshop is an on-demand training that gives you the step-by-step process you need to create amazing content regularly...even if you're the FURTHEST THING from a natural writer. You’ll walk away with the content writing process that I’ve perfected over the past 8 years of full-time content marketing. The stuff that’s taken me from an insecure intern writing rambling blog posts about topics she barely understood, to the majestic content unicorn standing before you. I didn't feel like I was a writer. I thought I was doing writing wrong - since I don't have that ability to just sit and write a whole post in a free-flow style. Your advice unlocked my inner writer - finally! Thank you SO much for teaching me a method that gets me consistent, amazing content, and that allows me to be the writer I've always been! After getting your content skeleton, I added your content mission to my own template. And dang, does that help! I'm a rambler and I tend to go on tangents, and suddenly find myself saying 'what the heck was my point?!' This has helped me stay on track and make my posts more cohesive. After purchasing through Teachable, you’ll receive instant access to all resources. As you watch the workshop, you'll walk through the included content planning workbook during mini-homework breaks. To take action on your new process in the future, you can download the project management template to add to your own system, whether that's Trello, Asana, or something else! "As a fellow content marketer, thanks for putting this together. I’m using it to onboard a new intern!" "Wow this exercise alone has given me so much insight! I’ve got 3-4 legit blog post ideas now as opposed to my “Maybe I can try write about this?” ideas "
"Amazing! I wasn’t even sure what topic to choose, and now I have 10+ solid ideas. Woot!" But how do I know what I'm talking about? I’m Brittany, and content is my jam, peanut butter, and marshmallow fluff. In 2011, I accepted a content marketing internship at a tech startup having no idea what content marketing was. And when I reread my first blog posts there, OMGGG could you tell. But by the end of that summer, I’d taught myself so much that they hired me permanently to get serious about content marketing. Since then, I not only figured out this whole content thing for myself, I also built and trained content teams at two different startups, creating amazing content unicorns out of marketers who were all “ummm yeah...I’m not really a writer,” when we first started working together. 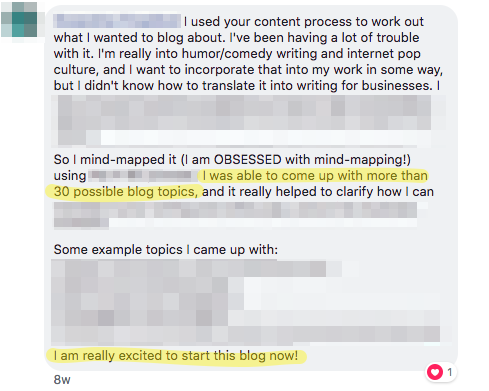 In 2017, I left my Head of Content job to work for myself and build a business based on my writing, and that *really* put my process to the test. My writing and content marketing advice has been published by The Next Web, Entrepreneur, Buffer, and more. And this workshop is the first time I’ve shown strangers how I do it! You're just 2 HOURS away from having the confidence and process you need to FINALLY create all the content you know want and know you need to! This is a pre-recorded workshop that you can work through at your own pace, with an accountability group on Facebook to ask questions and get feedback on your writing. Do I need to have a bunch of ideas or content already? Absolutely not! Feel free to bring what ideas you do have, but your first coworking break will be a brainstorming sesh using my favorite method of coming up with ideas! Sorry, because of the on-demand nature of the content, no refunds can be given. Awesome! Send a note over to brittany(at)brittanyberger(dot)com.